Today we will cover how to execute a full tummy adjustment on Sorbetto and how to raise or lower the darts. If your muslin offers a good fit in the back, but the front feels tight in the abdomen, you need a full tummy adjustment. Note that if your Sorbetto is tight overall—from the midsection down, and not just the front—you may want to consider blending sizes instead. A fuller tummy requires two things: additional room in the midsection as well as a little extra length. This adjustment is super easy and will help you achieve a better fit. 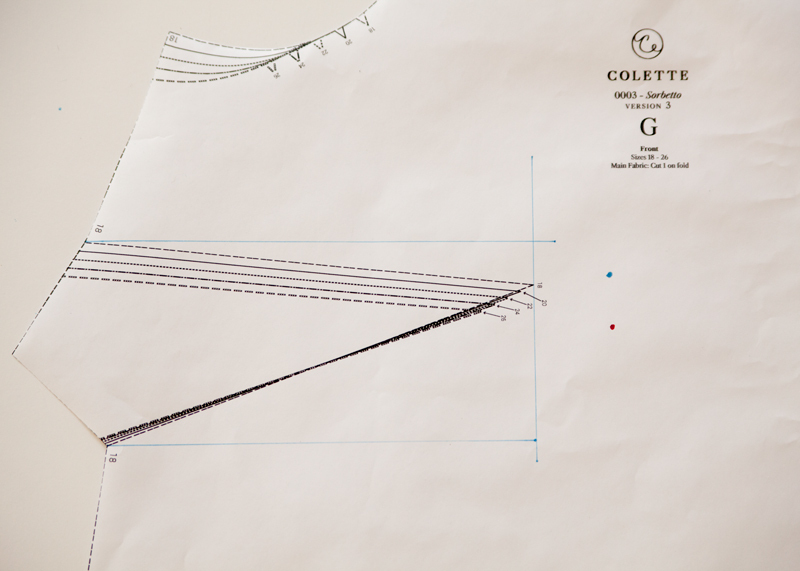 1) Using a pencil and a clear ruler, draw the stitch line at the side seam, below the bust dart. 2) Below the bust dart, draw a line that is perpendicular to the grainline. 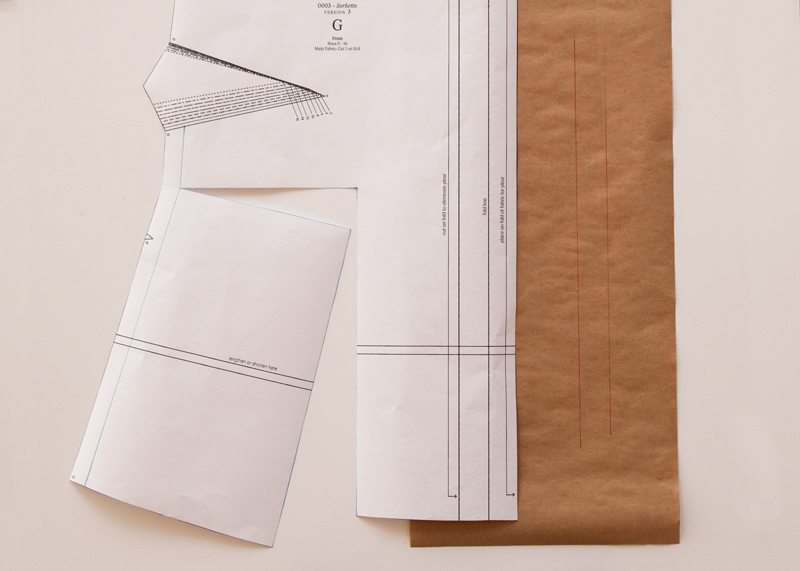 The line starts at the side seam and ends midway between the side seam and center front. This is line A. 3) Draw a second line, parallel to the grainline, from the hem, intersecting with line A. This is line B. 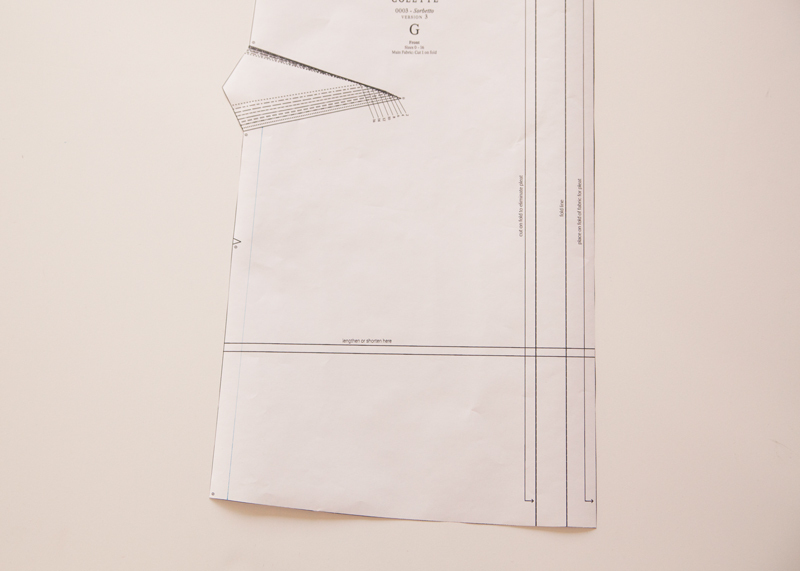 4) Using paper shears, cut along line B, starting at the hem. Pivot at the intersection, cutting along line A and stopping at the stitch line. 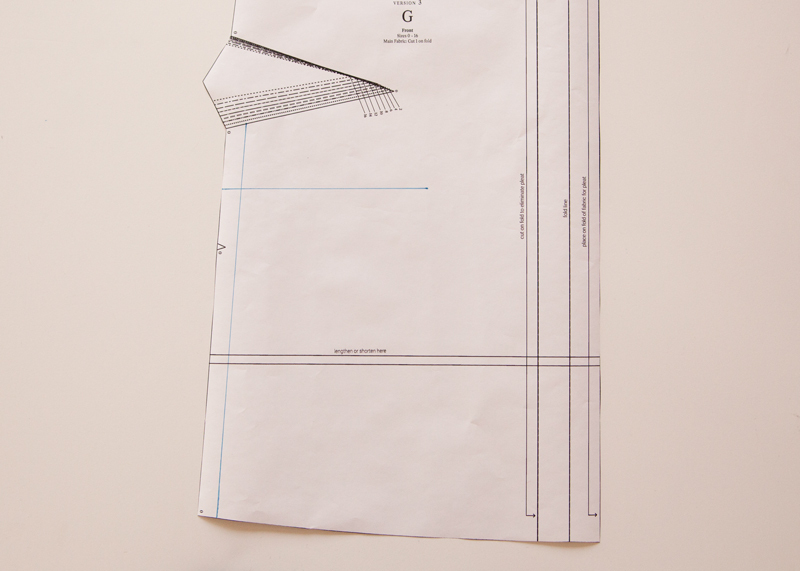 Snip through the seam allowance at line A, leaving a small paper hinge. 5) On a separate piece of paper draw two parallel lines. The distance between these two lines should be half the amount you wish to increase the abdomen by. 6) Place your pattern on top of your guidelines, pivoting the pattern. Tape the center portion of line B to the guideline. Pivot the pattern until the lengthen shorten line aligns with the opposite guideline. 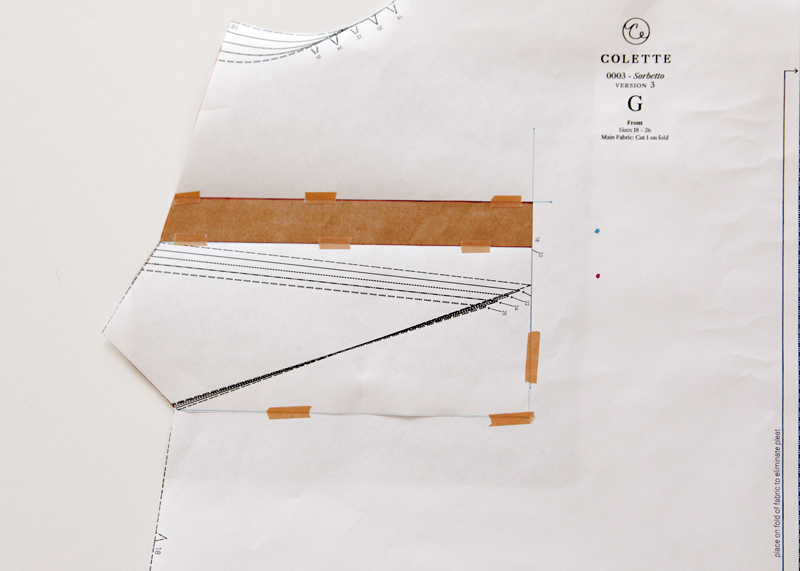 7) Use the lengthen/shorten line to lengthen the center front to align with the side front of your Sorbetto. 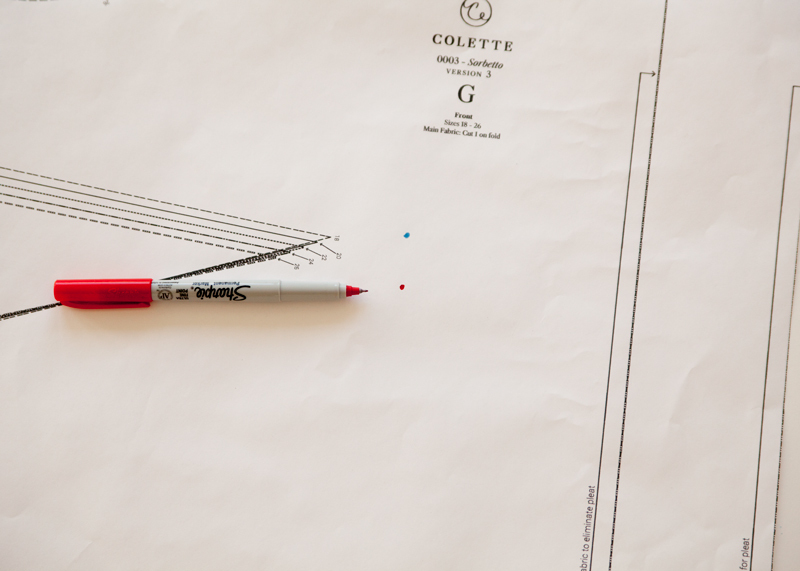 1) On your pattern piece, mark the existing apex. On Sorbetto your existing apex will be 1 1/2” away from the dart apex. 2) Mark your bust apex. 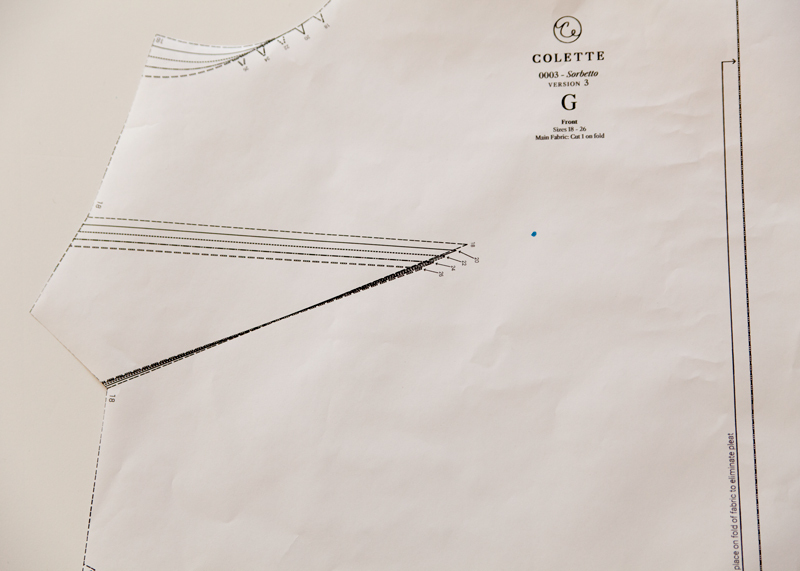 This can be determined by sewing a muslin, or by simply holding your front bodice piece over your body. 3) Measure the current apex in relation to the desired apex. In this example, we are lowering the dart by 1”. 4) Using a ruler, draw a box around your dart. The vertical side of the rectangle should touch the dart apex and be parallel to the grainline. 5) Cut along the drawn lines. You can now move your dart up or down to raise or lower it. 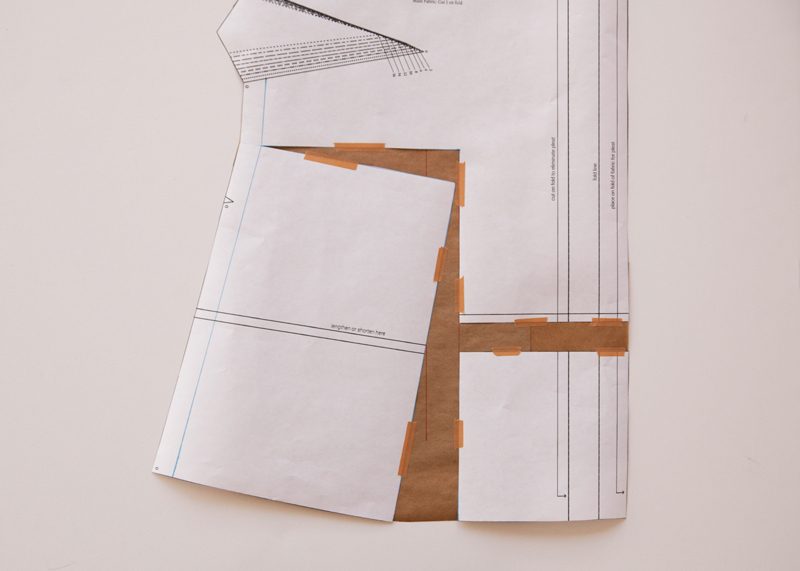 6) Tape the dart in place, using pattern paper to fill the gap in your pattern. 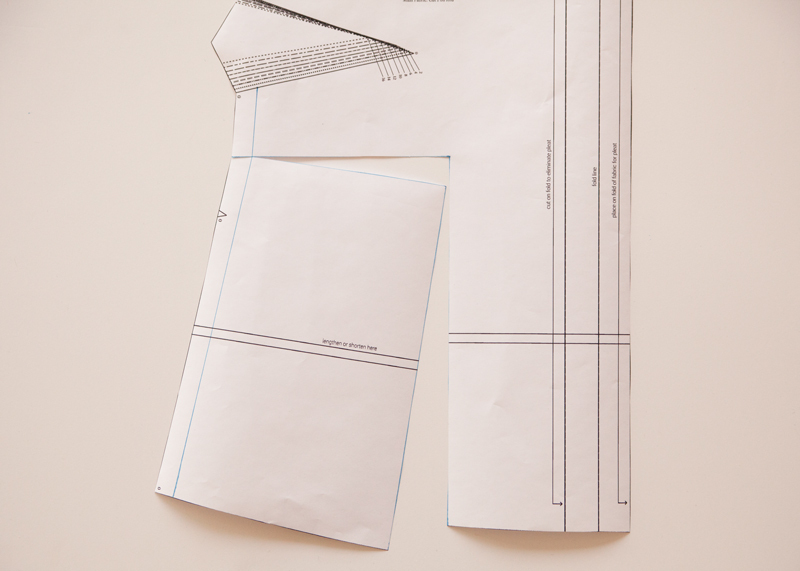 7) Redraw the side seam. 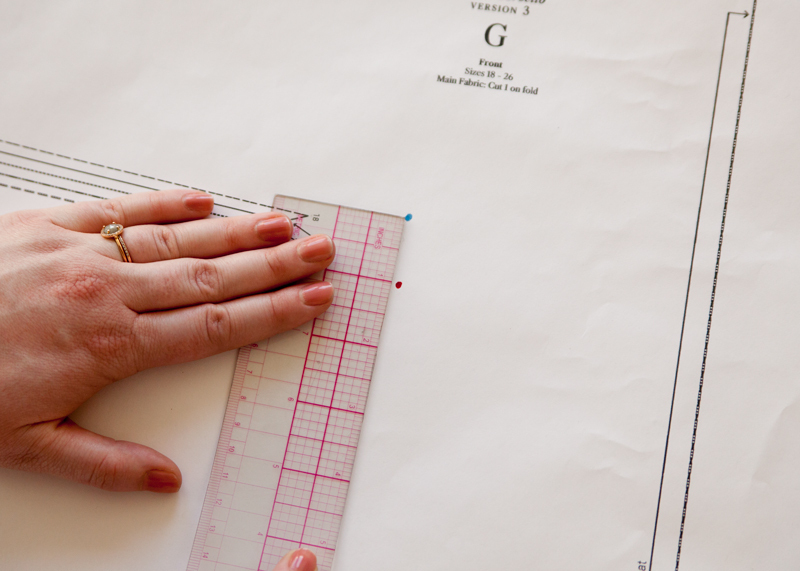 Finally, it will be time to move forward with garment construction! On Monday, Katie will cover cutting and prepping your Sorbetto. So helpful! Now I just want to start!!! But am reluctant to because I know I will learn more in your next sessions. Hi again! I (‘bravely’) slashed my muslin for narrow shoulders) on one side. I left the other side with sleeve in to assess the difference. This improved the fit (yay!) but I may take out a little more than the 2cm I tried. I thought I’d wait for the dart adjustment before sewing the sleeve back in. My dart needs to be higher and shorter. There isn’t a lot of room in the size 0 to raise it. Before I try it please advise on shortening the darts so I can do it in one go. At least one other ‘SALonger’ had this problem also. Hi Lynda, The method illustrated above is great for raising a lowering a dart, but I would use a different method to shorten a dart. First, draw a line directly down the center of your dart, from side seam to dart apex. Then draw a new dart point on this line. the distance between the existing dart point and this new dart point should be the amount you wish to shorten by. Redraw your dart legs using the new dart point. Hope this helps! Can you clarify how to figure out whether one needs/wants to change the placement of the dart and also how to determine one’s bust apex? Thanks. Hi Susan, I am happy to clarify! Darts always point toward an area of fullness. In the case of a bust dart, the tip of the dart should point to the fullest point of the bust—also known as the bust apex. If you made a muslin you can try it on and use a marker to mark your apex. 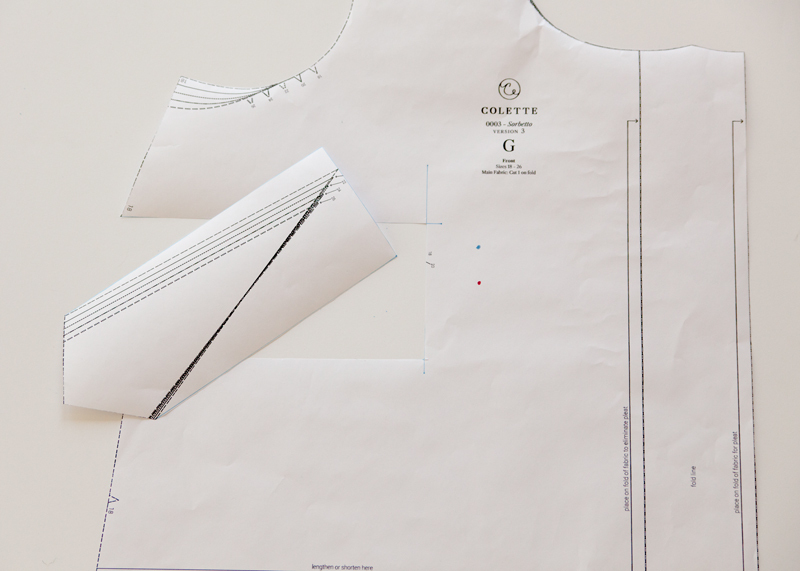 You can also hold your pattern over your body, aligning the shoulder seam with your shoulder and the side seam with your side (be mindful of seam allowance), then mark your apex directly on the pattern peice. If your dart points above your bust apex, then the dart needs to be lowered. If the dart points below your apex, then it should be raised. Hope this helps. Happy sewing! In the sample drawing the existing bust apex appears to be above the actual point of the dart. You clearly specify it will be 1.5 inches from the apex but not how far it should be above it. How do I determine where the existing apex is vertically on the pattern so I know I will measure the correct distance to lower my dart? Thanks. Hi Lois, that is because the dart is at a slight angle. To determine the existing apex, draw a line directly down the center of your dart, from side seam to through the dart point, and a little beyond. Your existing apex will be 1 1/2” beyond the dart point on this line. Hi! I have a full belly, and large breasts. Should I attempt to do a full bust adjustment AND a full belly adjustment for my muslin? Hi Erin, I am happy to help. A full bust adjustment will add some extra room to the belly. I would suggest doing an FBA, then making a muslin. You can then assess whether any further adjustments are needed for the belly region. My measurements are upper bust 47, full bust 52 waist 47 and hips 51. 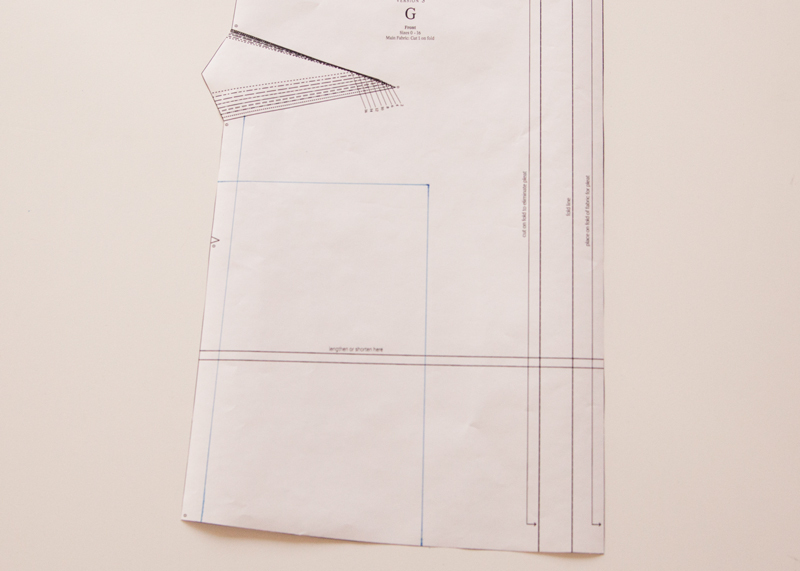 I decided to cut my pattern at size 24 but I’m anxious about making fit adjustments for some reason.